Madley, UK. 3 May 2016. ETL Systems, a global designer and manufacturer of RF equipment for satellite communications, has announced the launch of a new range of products for Global Positioning System (GPS) and the broader Global Navigation Satellite System (GNSS) applications. The new range includes outdoor and indoor GPS over Fibre Outdoor and GPS Splitter units, which provide a reliable method for distributing GPS timing signals from a single antenna. GPS is much more accurate at timing signals than radio based time transmissions. A GPS locked Network Time Protocol Server (NTP) – the most widely used protocol for the dissemination of time on computer networks – is a network appliance designed to obtain precise time from the GPS satellite positioning system and synchronise a network of devices. The device ensures that accurate timing is provided to servers, workstations and communications network infrastructure. ETL’s GPS over optical fibre distribution system is a cost effective solution, which allows GPS antennas to be located on a roof where they can have a clear view of the sky and the receiver to be located in a separate location, such as in a server network room. ETL’s StingRay GPS over Fibre compact and weatherproof outdoor transmit unit is housed in an IP65 rated weatherproof enclosure and is designed to be mounted close to an antenna. The receive indoor unit can house up to 4 hot-swap GPS over fibre modules, each with a -20dB monitor port to measure input signal levels. The chassis provides resilience with dual redundant, hot-swap power supplies and local and remote control and monitoring, with a web browser interface. The GPS range of splitters provides a compact solution to passive splitting of the GPS signal and can be used for redundancy by combining signals from multiple antennas in to a single channel, or splitting the signal from a single antenna. 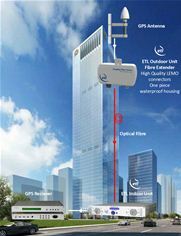 For further information about ETL Systems, please visit http://www.etlsystems.com.